After my video-review of the "My Pillow" (spolier -- it wasn't my cup of tea!) -- see video here -- I thought it might be helpful to provide some less-expensive alternatives. I have tried each of these pillows in person, in my home. Each are what I would consider to be "mid-priced," meaning in the $20 to $40 range. (NOTE: the prices were all in this approximate range as of the date of publication, 04/22/2017. Prices can, and will, change, so see the price in the widget below each listing.) In other words, more expensive (and nicer) than cheapo pillows at Wal-Mart or Target, but less expensive than so-called premium pillows that run over $50 each. Each of these can also be purchased through Amazon (they might be available via other outlets as well, but I've only verified through Amazon). Of course, pillows, like mattresses, involve a fair degree of personal preference. What one person loves, another might hate. Keep in mind that I'm an adult man, about 5'11", and "not skinny." As always with Amazon stuff, you can return it within 30 days if you don't like it. 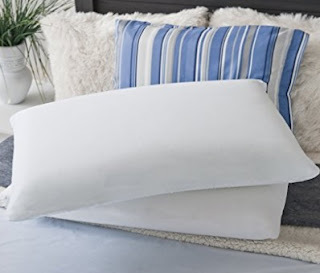 This one is kind of a big pillow -- it's roughly 5 to 6 inches thick (product says 5, I say more like 6). When I lay on my side, it fills the entire space between the bed and the side of my head. It's actually a perfect side-sleeping pillow for me. It's memory foam, but it's softer and a bit squishier than straight-up memory foam - maybe that's the "open cell" technology in the description. make as good of a model. barely, but not really, feel. The firm side is also the cooling side. At least in my experience, it is cool to the touch especially at first. This guy is also dense and heavy! Over 5 pounds! It's a "meaty" pillow. For me, personally, this pillow isn't my all-night-every-night pillow but that doesn't mean it's bad. I don't use it at night exclusively because I sleep both on my back and my side, and it's too tall when I sleep on my back. Not by a lot, but by a little. 2. You want something soft-yet-not-too-squishy for under your knees when back sleeping. #2: Zinus Memory Foam Traditional Pillows (pack of 2) This pillow is totally, straight up, the very traditional memory foam feel. If you want that feel, look no further! Well, OK, look a little further down in this review, because you do need to consider size, as well. No picture of model-on-pillow available! opposite of pillow #1, in that it's a not quite tall enough for me (remember that personal preference thing?). Now, it does come in a set of two, so maybe you could put them together or layer them. This pillow is 4.8 inches thick according to the company, but of course memory foam compresses, so once compressed, to me it feels more like 3 inches. So it's too slim for me when I lay on my side. 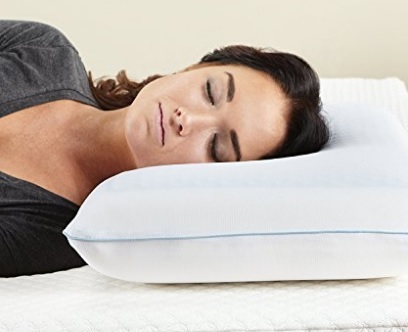 I would recommend this pillow for a small to average sized woman, a child, or just someone who likes a thinner pillow. Full disclosure: I won this pillow through a "refer a friend" contest with Zinus. 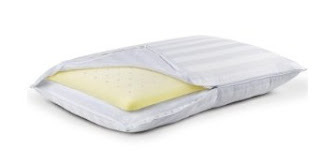 #3 Sleep Innovations 2-in-1 Ventilated Memory Foam Pillow As you may have guessed, I saved my personal every-night pillow for last! I like "a bit" of the memory foam feel with my pillow, but not completely. I do prefer the traditional down-like feel against my head. That's what this guy does. It's called 2-in-1 because one side has a memory-foam insert. So it's like sleeping on a half-and-half pillow! memory foam insert "catches my head" before it sinks in too much. It's a good compromise for back or side sleeping - and I do a lot of both. I'm not saying it's the best pillow on the market, but I would venture to say it's the best in it's price point. At least, the best I've tried. Some day I might get into super-fancy pillows, but I haven't yet. I'm very happy with this one. It says it is 6.5 inches, but bear in mind that half of it is easily compressed. I would say it squishes down to a perfect 4-5 inches when I lay on it. It might be too large for a petite person or a child. Also note it does not sleep hot, but it's not really a "cooling" pillow either. Questions? Comments? Would love to hear from you! Please comment, share on Facebook or Google+, and/or click on my links if you would be so kind. That helps me keep on blogging!